My weirdest obsession with used postcards is back. For those who are new in my blog, I developed this interest of buying used postcards last year. Checking back my posts, the first used postcard I featured was in August 2015. It has been roughly a year since I engage in this weird hobby. Most of my used postcards were bought from the vintage and antique shop near Sta. Cruz Church. You can find the details here. To date, I have six used postcards and envelopes in my collection. I initially thought that my favourite shop already ceased operations. The kiosk is always closed during the past months I visited. However, the story changed when I went home early last week. After a short trip to Escolta, I decided to pass by the area again. Much to my surprise, the shop was open. Turns out, the couple who runs the shop are Muslims. Perhaps on the times when I dropped by, they were engaged in some fasting activities. Hence, the temporary closure. So all is well now. Haha I'm a happy kid again. Even with a struggling wallet, I bought some vintage postcards for my friends. I also rummaged the pile of dusty cards and was fortunate to discover another used postcard. Unlike my previous finds, this postcard is relatively young to be considered as vintage. It dates back 1988, based on the postmark. The stamps could have made another verification. Unfortunately, it has been peeled off already. The card is only 28 years old, but its condition made it look older. The other postcard I got that dates back 1966 looks even better. The paper's skin discolouration went so bad as well. My guess is that the paper has been thoroughly exposed to extreme weather conditions. This in effect also caused further lightening of the pen's ink. It will take a little effort before anyone can fully read and understand the writing. I tried my best to get a clearer photo of the handwriting. Unfortunately, this is the best my photo editing skills can achieve. I tried my best to read and understand the letter. Apologies to my foreign friends, I cannot fully translate its contents. In a nutshell, the sender is a Filipino immigrant stationed in Canada. The immigrant related his / her struggles while living in Ontario Canada. He / She has to work in the morning and attend classes in a state college in the evening. I initially thought that the sender was a working student. Probably, someone who is on his / her early 20s. I can't really tell. What surprised me was the parting words containing a very Filipino request, kayo na po ang bahalang magpayo sa mga bata. (#MMK Story feels, hahaha) The sender was requesting the recipient to take care and guide the children. There was even a mention of another name, Freddie, whom I believe was the husband or the sender? So this confirms that the sender is probably a wife and a mother. Or I might have been referring to the sender as a migrant worker instead. With these information, I already started crafting different stories in my mind. Hahaha What remains unclear, what is the relationship of the sender to the recipient. The sender addressed the recipient as Mamang (for the male) and Papang (for the female). The Filipino version for Mama and Papa. I can't really conclude because some Filipinos in the South addressed their grandparents as Mamang and Papang. So I guess, the sender was a grandchild who left her children to her grandparents. I tried to search the address through Instant Street View. I'm not well versed with the names of the streets in Manila. 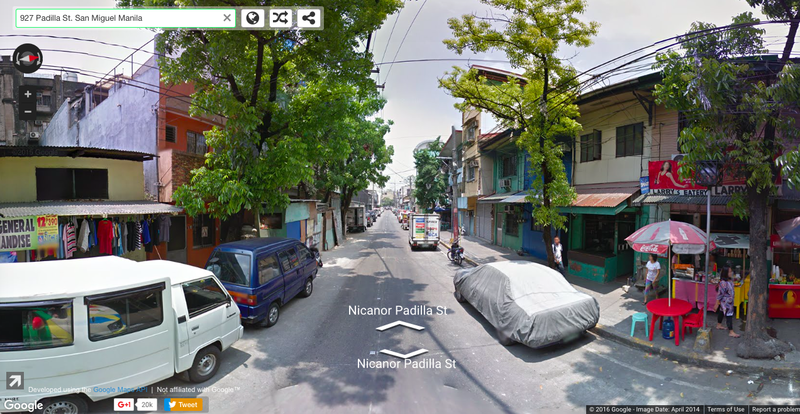 I tried Padilla St. and was later directed to Nicanor Padilla St. Both are in San Miguel Manila. I'm not sure if the two streets are one. Although part of me believes because the images from Instant Street View showcased a residential site. One of the houses in this area belongs to Mr. and Mrs. Ross de Jesus, the owners of the postcard. So this is how far my online search skills can extend. I believe there are other means to trace the sender and owner of the postcard. I'm interested to know whether the sender was reunited with the kids and the husband. I assume. Probably, all the people in the postcard already migrated to Ontario or they eventually remained and settled in Manila.. or any other place in the Philippines. Cool! It's not weird at all. I think you're an old soul and sentimental, kaya siguro yan mga trip mo, hehe. Napaisip din tuloy ako sa story ng buhay ng postcard sender...usiserang frog lang! Hahahaha. I hope you find them and know their story. Hi Tracy! Thank you for sharing your story. It's not everyday that I encounter readers sharing their personal story. Your mother loves you so much. And as they say, distance is never a hindrance to express one's love. In fact, it strengthens the existing love you have for each other. As for the definition of "used postcard," I actually buy them from a vintage stall in Sta. Cruz. I don't think it has been disposed by the Post Office. I think the seller buys them personally from the real owners or possibly, the relatives of the owners.